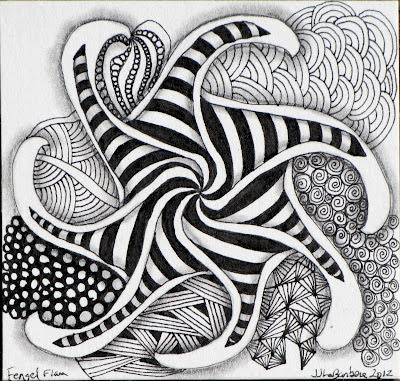 This week a new zentangle pattern came out. It is called Fengle. As with many tangle patterns that are curved and "free flowing", Fengle presented a bit of a challenge to me. So many of you are seemingly able to produce these lovely effortless swirls and curves and I will confess, I am jealous. Anything that is more than a ) shape taunts me to no end. I need to work on curves rather than allow them to have this power over me. With this in mind, I did this week's challenge from the Diva. I wasn't going to do this one and use a wedding gift I am working on as an excuse not to try. But, I bit the bullet and jumped in. I ended up with more than 5 "arms" on this tangle. One of my problems with this is my spacing. Some seem too close together while other have a Grand Canyon of space between. So, I filled the canyon with another S.
I was going to stop and leave Fengle on the tile alone but I couldn't leave it alone. I love the idea of a pattern in the "open" space of Fengle. I added the stripe and am pretty pleased as to how it turned out. The "arms" aren't so separate here as they are in the work of others. I'll need to keep working on that. I decided to add some small tangles in the spaces between the arms. Just to keep it from being too blank more than anything. This is one proud fengle.... I mean, stately with its gorgeous lines. I love it! Fengle is an ever evolving pattern and you did it proud! I find it fun to see the various tangles. 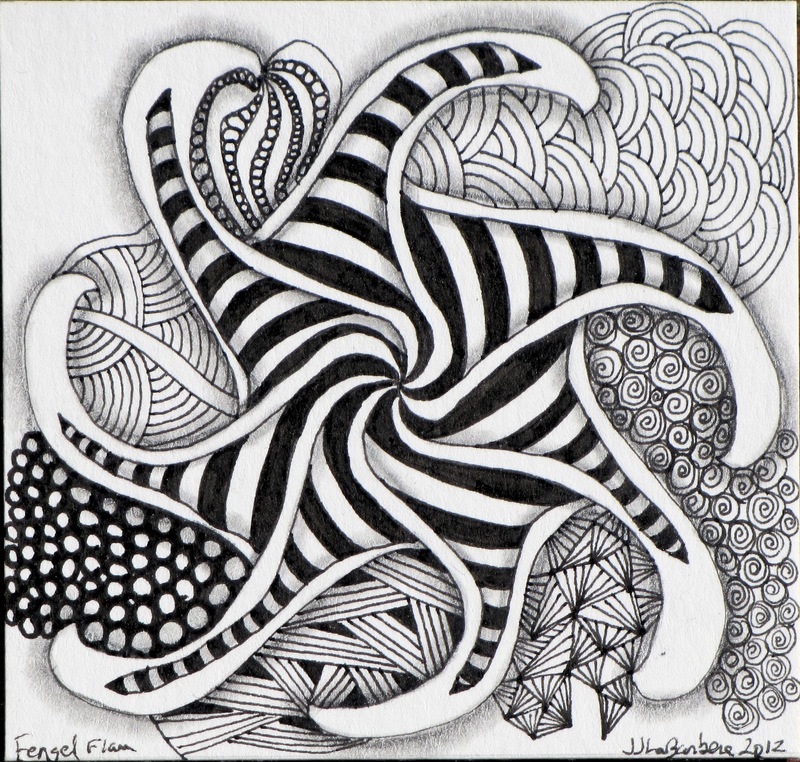 As a draftsman and new with the zentangle I learn now that you can combine several tangles in a Tangle challenge. For me it is all patterns are new! Off course patterns exist ages all over the world. Love the stripes, it works beautifully with Fengle. Your tile is great, very dynamic. Your Fengle is striking! And the background tangles compliment to well. Nice work. Very dynamic tile! Those stripes add a lot of pizzazz. I find it helpful to put little dots evenly spaced around the center, then try to aim my fengle "arms" through them, although sometimes it can look more organic if the arms aren't all perfectly spaced. I don't think it matters how many arms you use.